Ready to create a Mixed Media Masterpiece? This Mixed Media Art Journal is beautiful and functional. This project is perfect for anyone interested in learning more about Mixed Media and using texture in your art. 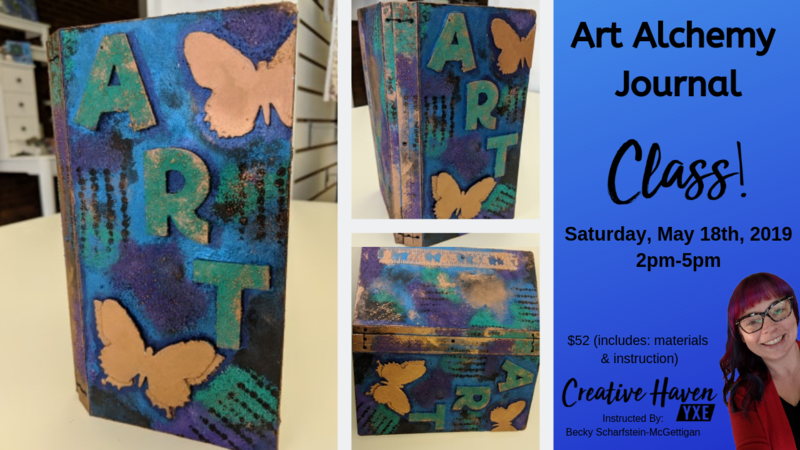 Becky will walk you through step by step to create this fabulous journal, including signatures. This project features Finnabair Rust Effect Paste, acrylic paints, die cuts and much more. In this workshop you will learn how to create the cover and inserts. This is a great workshop for anyone interested in learning about adding texture and dimension to a project. You will have so much fun you will want to add it to everything. Becky will walk you through creation and assembly of this beautiful journal. Come and join us at Creative Haven YXE for an amazing afternoon, you will not want to miss this amazing workshop.